Regular visitors to this page know about my weakness for pies and tarts. 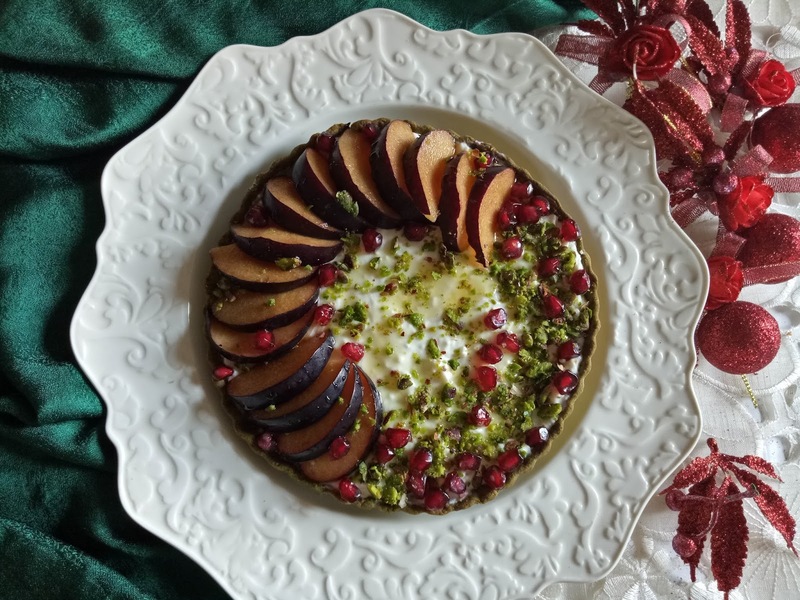 My latest obsession is to make them with one of my favourite milk products, labneh. The colours on the topping make it look so festive and the fact that this does not need to be baked makes it even better. This one was made with a matcha pastry shell. Labneh needs to be strained for at least 12 hours before you can use it for filling a tart shell. I used store- bought plain curd. 400 grams of curd stained overnight is reduced to 200 grams. This is just right to fill a small tart shell that serves 3-4 people. Since I don’t like having curd that is sweet, I did not mix any sweetening agent into the strained curd. The sweetness comes from the toppings and a drizzle of honey. I think for serving guests, some honey and also fruits used used for the topping could be placed in small bowls. Although I have read about matcha and tasted it in restaurants, this is the first time I bought a packet. The first thing I did was to use a teaspoon of it in the pastry dough. I loved the colour and the fragrance. 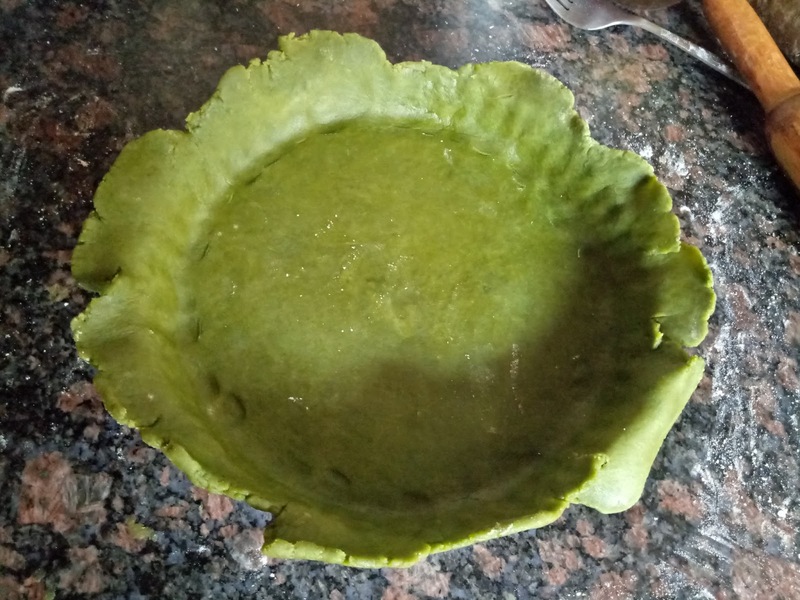 Place the flour in a bowl and add the butter, sugar, and matcha powder. Rub with the tips of your fingers till the mixture becomes crumbly. Add the egg and bring the dough together. Do not knead. Shape the dough into a ball, flatten it, and wrap it in clingfilm. Chill in the refrigerator for at least 40 minutes. With pastry, if I plan it ahead I usually chill the dough overnight. Take out the dough from the fridge and let it thaw for a while. Meanwhile grease the tart tin. Then cut out half and roll out a little bigger than your tin. Place it on the tin and press all along the bottom. Gently press on the top portion too, all along the edges, before you use the rolling pin to even out the overhanging pastry. The extra bits of pastry can be gathered up, made into a ball and chilled again for later use. Prick the bottom of the pastry shell so that the dough does not rise up during the baking process. Chill the prepared shell for 30 minutes or so. Line the shell with a greased foil (greased side down as this makes it easy to remove the beans). Fill with baking beans and bake in a preheated oven for ten minutes. Remove foil and beans and bake again for another 10-12 minutes. Remove and cool as you prepare the filling. This 8″ tin needed 350 grams of labneh. Take the labneh and mix any sweetener you like. 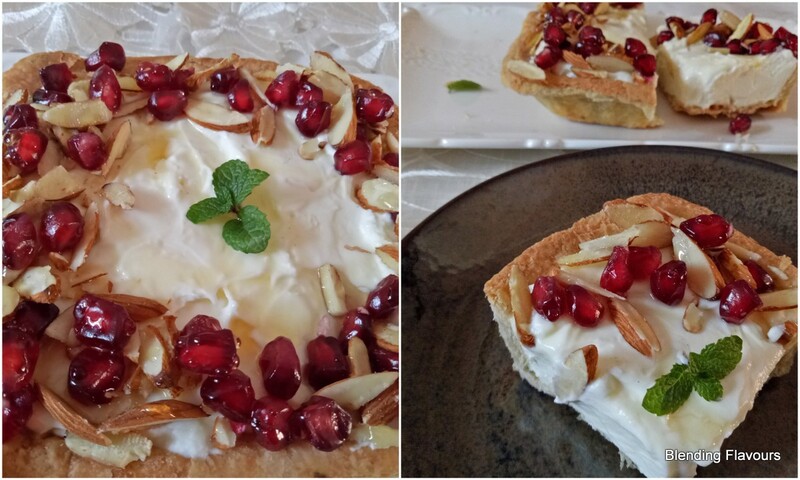 Since I didn’t want an overly sweet filling, I skipped this part and placed the plain labneh in the tart shell. Smoothen the surface. Layer with your choice of fruits and nuts. I wasn’t planning to use plums but I found these that were really sweet. So they were sliced and drizzled with a bit of honey. 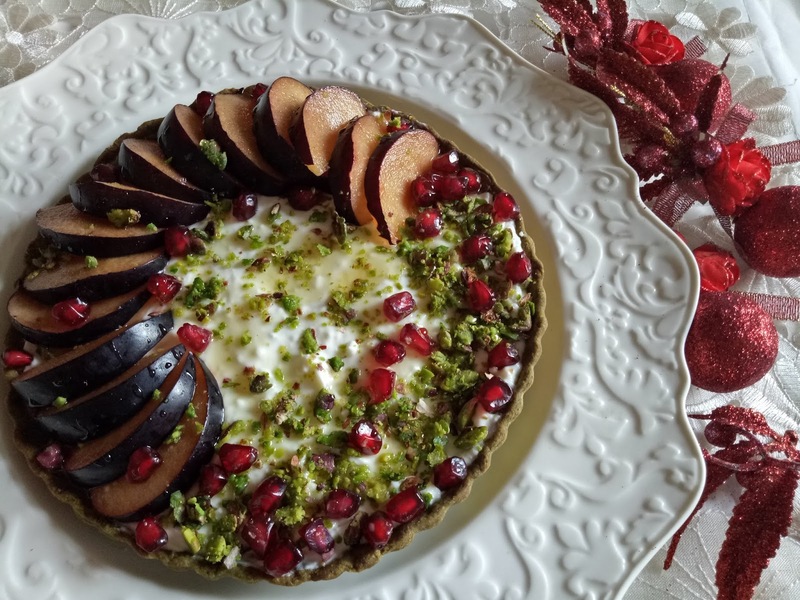 Lightly toasted and ground pistachios and pomegranate arils were the rest of the embellishments. The first time I used labneh in a tart was with left-over pastry dough. This was a square 4″ tart pan. For the filling I used 200 grams of labneh. Pomegranate arils and toasted/sliced almonds did the rest. A teaspoon of honey was drizzled over the surface. These tarts will not keep for long as the bottom will get soggy. I was lucky mine finished off fast! Thank you for stopping by today. Merry Christmas!